Methyl-Optimize: the best cocktail of Methylated Folate and essential B vitamins to counteract lower MTHFR activity and improve female fertility! Methyl-Optimize is the latest product of our dietary supplement range. Our formulation contains Methylated Folate (that benefits patients with detrimental MTHFR polymorphism) in addition to essential B vitamins (B2+B6+B12) which hold great potential in reducing oxidative stress, supporting adequate homocysteine metabolism and methylation process thus counteracting oxidative damage to oocyte and boosting your oocyte quality! In this blog, we will describe the studies showing how the different ingredients used in our dietary supplement could help improve your fertility. These genotypes reduce DNA methylation, and possibly increase chromosomal instability. MTHFR 677C/T is associated with a significant decrease of MTHFR enzymatic activity that can reach up to 70% in homozygous (MTHFR T/T), while the heterozygous (C/T) genotype has a 35% decreased activity. MTHFR 1298A>C polymorphism results in a slight decrease in MTHFR activity. Nevertheless, double heterozygote MTHFR 677 C/T and 1298 A/C results in the lowest MTHFR activity. Normal MTHFR activity is crucial to maintain normal levels of circulating folate and methionine and to prevent the accumulation of homocysteine (a toxic amino acid). Hyperhomocysteinemia is observed in approximately 5% of the general population and is associated with increased risk for many inflammatory disorders including auto immune disorders (Rheumatoid Arthritis, Diabetes, Multiple Sclerosis, Systemic Lupus erythematosus, Grave disease), birth defects and adverse pregnancy outcomes (pre-eclampsia, placental abruption, spontaneous abortion, low birth weight), vascular and neurodegenerative diseases. Adapted from Jason W. Locasale. Nature Reviews Cancer 13, 572–583 (2013). Figure 1: The folate cycle and the methionine cycle are two metabolic pathways existing independently. In the folate cycle, folic acid is imported into cells and reduced to tetrahydrofolate (THF). THF is converted to 5, 10-methylene-THF (me-THF). Me-THF is then reduced to 5 methyltetrahydrofolate (mTHF) by methylenetetrahydrofolate reductase (MTHFR). 5-mTHF is demethylated to complete the folate cycle by donating a carbon into the methionine cycle through the methylation of homocysteine (hCYS) by methionine synthase and its cofactor vitamin B12 (B12). 2-	How can MTHFR activity, folate and homocysteine levels affect my fertility? a-	Folate deficiency, oocyte quality and pregnancy outcome Women carrying the 677 TT genotype have increased blood homocysteine concentrations (1), especially when their folate intake is insufficient. A higher prevalence of MTHFR C677T homozygotes has been linked to implantation failure during an IVF cycle (2). During folliculogenesis, hyperhomocysteinemia may induce apoptosis, thus leading to follicular atresia (3). Further, a negative correlation has been reported between follicular fluid homocysteine concentrations and the number as well as the degree of maturity of retrieved oocytes (4). Similar findings were observed with embryo culture in vitro on day 3, the higher homocysteine levels were in the culture medium, the worst the embryo quality was (5). On the other hand, follicular fluid folate levels have been shown to positively correlate with embryo quality (6). In addition, hyperhomocysteinemia also affects IVF outcome with significantly lower pregnancy and implantation rates whereas the miscarriage rate was higher in patients with elevated homocysteine levels (7-8). In the same way, low folate levels have been linked to higher miscarriage risk (9). b-	Thrombophilic issues and hyperhomocysteinemia during pregnancy The importance of folate intake during pregnancy has been largely described. Indeed, folate is essential to multiple processes including DNA synthesis and methylation, two processes involved in the regulation of gene expression. If DNA synthesis and/or methylation (epigenetic events) are altered in utero, this could affect gene expression thus impacting fetal development and that could modulate the fetal susceptibility to various diseases. Thrombophilia is a condition predisposing to venous thromboembolism (VTE or thrombosis) due to hematological changes and can be inherited or acquired. By inducing hypercoagulability, inherited thrombophilia may cause pregnancy losses and other adverse pregnancy outcomes such as preeclampsia, intrauterine growth restriction (IUGR), placental abruption, and stillbirth (10). Slightly increased levels of homocysteine are associated with inducing a hypercoagulable state and an increased risk for thrombosis (11). A study showed that hyperhomocysteinemia represents 5–10 % of all thrombotic episodes and MTHFR C677T variant homozygosity is strongly associated with pregnancy complications and severe pregnancy outcomes (12). c-	MTHFR and oxidative stress during pregnancy Methionine metabolism gives rise, through a complex mechanism (i.e. transmethylation and transsulfuration pathway) to glutathione. Glutathione is essential for cell health, maintaining a balance (redox balance) in substances such as reactive oxygen (RO) and nitrogen species, whose dysregulation leads to oxidative stress. Accumulation of homocysteine due to disrupted folate metabolism prevents the formation of methionine and lead to oxidative stress (13). There is increasing evidence that oxidative stress is triggering inflammation that may impair oocyte and embryo quality (14) and ultimately lead to miscarriage or adverse pregnancy outcome such as pre-eclampsia (15). 3-	How can Methyl-Optimize help support my fertility? prevents up to 100% of neural tube defects (16) and could reduce the risk for recurrent neural tube defects in the next pregnancy by around 70% (17) when taken prior to conception. scavenge free radicals thus preventing the deleterious effects of oxidative stress on oocyte and embryo quality and more generally on the maintenance of pregnancy. Riboflavin is crucial for oxidative defense. A deficiency in riboflavin, among other B vitamins, has been associated with an increased risk of placental abruption, still-births, low birth weight, preterm deliveries, preeclampsia, as well as fetal malformations (28). Riboflavin also plays a key role in steroid hormones synthesis as well as Vitamin D synthesis (18). in inflammatory responses (21) while inflammation has been linked to early pregnancy loss (22). Interestingly, prior to conception, a poor vitamin B6 status decreased the probability of conceiving and contribute to the risk of early pregnancy loss (23). Adequate vitamin B6 levels can minimize the risk for preterm birth (PTB). Indeed, the risk of PTB was 50% lower among women with vitamin B6 30 nmol/l than among vitamin B6-deficient women (24). Methyl-Optimize includes Vitamin B6 to fight oxidative stress and support a beneficial environment allowing good oocyte quality and embryo development. Vitamin B12 is a key cofactor for methionine synthase, an enzyme that accepts methyl groups from 5-methyltetrahydrofolate (5-m-THF) and remethylates homocysteine to form methionine. Vitamin B12 is required for DNA synthesis, as well as amino acid and fatty acid metabolism (25). Several studies have shown an association between vitamin B-12 deficiency and female subfertility (26–27). Further, another study found a positive correlation between vitamin B-12 concentrations in serum and follicular fluid and embryo quality (5). Finally, many studies found a positive correlation with chances of live birth after IVF cycles and B12 Vitamin when used in combination to folate (8, 28-29). Our supplement Methyl-Optimize includes Vitamin B12 which help keep adequate homocysteine levels, inflammation under control thus preventing oxidative stress and its damaging effects on oocyte, embryo and pregnancy. Our cocktail of methylated folate and B Vitamins can reduce oxidative stress and inflammation by supporting adequate folate and homocysteine levels thus inducing optimal environment to allow harmonious oocyte maturation and embryo development with the best potential for a live birth. Methyl-Optimize is now available for purchase online. For more information about our supplements range, please consult our website. 1-	Fohr IP, Prinz-Langenohl R, Bronstrup A, Bohlmann AM, Nau H, Berthold HK, et al. 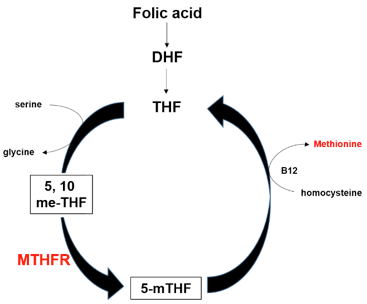 5,10-Methylenetetrahydrofolate reductase genotype determines the plasma homocysteine-lowering effect of supplementation with 5-methyltetrahydrofolate or folic acid in healthy young women.Am J Clin Nutr 2002;75:275–82. 2-	Azem F, Many A, Ben Ami I, et al. Increased rates of thrombophilia in women with repeated IVF failures. Hum Reprod 2004; 19: 368–70. 3-	Forges T, Monnier-Barbarino P, Alberto JM, Gueant-Rodriguez RM, Daval JL, Gueant JL. Impact of folate and homocysteine metabolism on human reproductive health. Hum Reprod Update 2007;13: 225–38. 4-	Szymanski W, Kazdepka-Zieminska A. Effect of homocysteine concentration in follicular fluid on a degree of oocyte maturity. Ginekol Pol 2003; 74: 1392–6. 6-	Ebisch IM, Peters WH, Thomas CM, Wetzels AM, Peer PG, Steegers- Theunissen RP. Homocysteine, glutathione and related thiols affect fertility parameters in the (sub)fertile couple. Hum Reprod 2006;21: 1725–33. 7-	Pacchiarotti A, Mohamed MA, Micara G, Linari A, Tranquilli D, Espinola SB, et al. The possible role of hyperhomocysteinemia on IVF outcome. J Assist Reprod Genet 2007;24: 459–62. 8-	Gaskins AJ, Afeiche MC, Wright DL, Toth TL, Williams PL, Gillman MW, Hauser R, Chavarro JE. Dietary folate and reproductive success among women undergoing assisted reproduction. Obstet Gynecol. 2014 Oct;124(4):801-9. 10-	Brenner B, Aharon A. Thrombophilia and adverse pregnancy outcome. Clin Perinatol. 2007 Dec; 34(4):527-41, v. Review. PubMed PMID: 18063103. 11-	Den Heijer M, Koster T, Blom HJ, Bos GMJ, Briët E, Reitsma PH, Vandenbroucke JP, Rosendaal FR. Hyperhomocysteinemia as a risk factor for deep-vein thrombosis. N Engl J Med. 334, 1996, 759-762. 12-	Peng F, Labelle LA, Rainey BJ, et al. Single nucleotide polymorphisms in the methylenetetrahydrofolate reductase gene are common in US Caucasian and Hispanic American populations. Int J Mol Med 2001; 8(5):509–11. 13-	Duncan TM, Reed MC, Nijhout HF. The relationship between intracellular and plasma levels of folate and metabolites in the methionine cycle: a model. Mol Nutr Food Res. 2013 Apr;57(4):628-36. doi: 10.1002/mnfr.201200125. Epub 2012 Nov 12. 14-	Augoulea A, Mastorakos G, Lambrinoudaki I, Christodoulakos G, Creatsas G. The role of the oxidative-stress in the endometriosis related infertility. Gynecol Endocrinol 2009; 25(2): 75-81. 15-	Gupta S, Agarwal A, Banerjee J, Alvarez JG. The role of oxidative stress in spontaneous abortion and recurrent pregnancy loss: a systematic review. Obstet Gynecol Surv. 2007 May; 62(5):335-47; quiz 353-4. Review. PubMed PMID: 17425812. 16-	Czeizel AE. Prevention of congenital abnormalities by periconceptional multivitamin supplementation. Br Med J 1992; 6893:1645–1648. 17-	MRC Vitamin Study Research Group. Prevention of neural tube defects: results of the Medical Research Council Vitamin Study. Lancet 1991; 8760:131-137. 18-	Pinto JT, Cooper AJ. From cholesterogenesis to steroidogenesis: role of riboflavin and flavoenzymes in the biosynthesis of vitamin D. Adv Nutr. 2014 Mar 1;5(2):144-63. 19-	Wouters MGAJ, Boers GHJ, Blom HJ, Trijbels JMF, Thomas CMG, Borm GFSteegers-Theunissen RPM, Eskes TK. Hyperhomocysteinemia: a risk factor in women with unexplained recurrent early pregnancy loss. Fertil Steril 1993; 60:820–825. 20-	Goddijn-Wessel TAW, Wouters MGAJ, vd Molen EF, Spuijbroek MDEH,Steegers-Theunissen RPM, Blom HJ, Boers GHJ, Eskes TKAB. Hyperhomocysteinemia: a risk factor for placental abruption or infarction. Eur J Obstet Gynecol Repr Biol 1996; 66: 23–29. 21-	Saibeni S, Cattaneo M, Vecchi M, Zighetti ML, Lecchi A, Lombardi R, Meucci G, Spina L, de Franchis R. Low vitamin B6 plasma levels, a risk factor for thrombosis, in inflammatory bowel disease: role of inflammation and correlation with acute phase reactants. Am J Gastroenterol 2003; 98: 112–117. 22-	Thellin O, Heinen E. Pregnancy and the immune system: between tolerance and rejection. Toxicology 2003; 185:179–184. 23-	Ronnenberg AG, Venners SA, Xu X, Chen C, Wang L, Guang W, Huang A, Wang X. Preconception Bvitamin and homocysteine status, conception, and early pregnancy loss. Am J Epidemiol 2007;2–9. 24-	Ronnenberg AG, Goldman MB, Chen D, Aitken IW,Willett WC, Selhub J, Xu X. Preconception homocysteine and B vitamin status and birth outcomes in Chinese women. Am J Clin Nutr 2002; 76:1385–1391. 25-	Lu, H.; Liu, X.; Deng, Y.; Qing, H. DNA methylation, a hand behind neurodegenerative diseases. Front. Aging Neurosci. 2013, 5, 85. 26-	Bennett M. Vitamin B12 deficiency, infertility and recurrent fetal loss. J Reprod Med 2001; 46:209–12. 27-	El-Nemr A, Sabatini L, Wilson C, Lower AM, Al-Shawaf T, Grudzinskas JG. Vitamin B12 deficiency and IVF. J Obstet Gynaecol 1998;18: 192–3. 28-	Gaskins AJ, Chiu YH, Williams PL, Ford JB, Toth TL, Hauser R, Chavarro JE; EARTH Study Team. Association between serum folate and vitamin B-12 and outcomes of assisted reproductive technologies. Am J Clin Nutr. 2015 Oct;102(4):943-50. 29-	Allen, L.H. Multiple micronutrients in pregnancy and lactation: An overview. Am. J. Clin. Nutr. 2005, 81, 1206S–1212S.